Beth Orton is authentic enough to endear herself to a folk audience and is a name associated with the dance fraternity when she lended her voice to tracks by the Chemical Brothers. Intensely private, rarely interviewed and kept out of the public eye, Orton has communicated through her music since her debut album "Trailer Park" ten years ago. New album "Comfort Of Strangers" is produced by Jim O'Rourke and is a low key, sparse but beautifully realized collection of songs which all posses a haunting quality. "Countenance" has the familiar fragile vocal which is typically the sensitive natural voice we've come to expect from Beth Orton. This song (and the album) is a stripped down sound with the folky country resonance of the material associated with the Americana scene. The voice dominates on this track with just the faintest hint of acoustic guitar and drums. The gentle strum of the instrumentation makes this immediate, short but very sweet song extremely endearing. Orton never over eggs the pudding with these songs on the album and as she trills the line "not much more to say" we can all but nod in agreement that less can indeed be more. 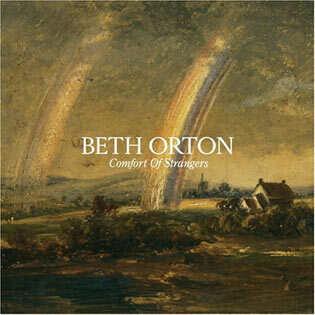 Title track "Comfort Of Strangers" adds piano to the mix which displays the natural vulnerability to Orton's vocals. The percussion is very subtle audible but not too intrusive on this gentle ballad which is a real slow burner, disquieting but immensely likeable in equal measures. "Absinthe" has a welcome burst of harmonica as well as bongo drums and piano. The low key production works wonders on songs this organic and home-grown. Beth informs us that "people always catch your name too late" in a sly, mischievous manner. Who needs orchestras when a few musicians can express so beautifully with the minimum of fuss. "Comfort Of Strangers" is a real labour of love for Beth Orton, eschewing commercial endeavour for 14 songs she can be truly proud of. This will stand up in years to come as a minor classic in Orton's recording career.